If there is one place to be courageous, it’s with your family. Courage counts most when love is at stake. The women of Thistle Farms are the best example of courage and healing I can think of because they are a family of lions who’ve overcome life on the streets. I wrote a story about the dinner we shared with a few of these remarkable women. Planning for Thanksgiving this year, I thought about them and how much a meal can mean. What is Thanksgiving really about? I think it’s a prayer for community and connection. We speak of gratitude, but what means the most is the people who make it home. Missing even one person feels like a tragedy. This year, I want our Thanksgiving to also be about healing. And healing requires courage. The courage to accept everyone in our family with an open heart, understanding that they may not love you back the way you want them to. In other words, I want to be Pope Francis for the day. In the last six months, we’ve lost two fathers and two pets. I’m beginning to understand the loss of my father, but my cousin Crystal’s loss of her father is fresh. Our dog Clarissa and our cat Tyler lived with us for 16 years. All I can think about is how much I took them for granted. My contribution to the healing process will be a relaxed attitude. I’m also going to tape the word acceptance to my ankle as a reminder. This may not seem like a big deal, but it is. I’ve been worked up several times about Thanksgiving this year, from who comes to how many people we can wedge around our table. There will be some very different personalities and divergent values present. Politics will be the least of our challenges. I also have a lurking fear of cold food and an overcooked turkey. Plus, we have a gluten-free cousin, a vegetarian daughter, two picky eaters, and a two-year-old cousin dead-in-the-center of the terrible twos. I will try not to float my anxiety in a glass of white wine. Our wine glasses are the size of large mangos. Family drama will bubble under the surface because it does. If I keep myself dialed down on Thursday, I will consider it a super-sized gift to all. I told everyone to wear whatever they want, although sweatpants will surely get on my nerves. They can spill on the “good rugs.” Goodness knows, our dogs have made a habit of choosing to pee and chew on these rugs exclusively. My Thanksgiving healing mantra will be — what matters is that everyone feel loved, comforted, and part of the family. This means that I can’t hiss at my husband, not even once. The Thistle Farm’s motto is, “Love Heals Every Body.” If you shared a meal with the women who work there, you would know it’s true. My husband Mark and I went to Whole Foods on Saturday morning because Thistle Farms was doing a special event. We sell their candles and bath products at our home goods store Catherine’s Table. Thistle Farms employs graduates of Magdalene, a two-year recovery program in Nashville for women who lived lives of prostitution, drug addiction and abuse. Their goal is to heal, empower and employ the women they serve. I wanted to meet some of them and get a picture for our Facebook page. 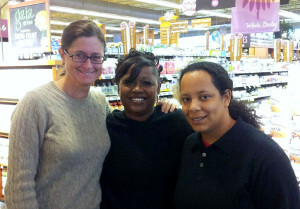 We introduced ourselves to Cynthia and Jordan and gushed about their products. Then I asked them over for dinner. Cynthia took my cell number, Mark and I bought extra food, and I wished and hoped they would join us. They did! Cynthia, Jordan, Gayle and Shana arrived with dessert. It was an instant love fest (for me anyway.) They were all so friendly and easy to be with. During dinner they shared their sad stories with complete candor and no shame, propping each other up with kind words and attention. They were at ease in the way you imagine people are when they forgive, accept and love themselves. Their stories were extraordinary. Gayle is a soft-spoken senior citizen who spent 26 years in prison, 10 on death row. She killed a husband who beat her regularly. She looks like an unassuming, suburban grandmother. Now she is the head of manufacturing and a mother to the other women at the table. Cynthia and Shana were prostitutes. Their individual stories of physical abuse and losing children are heartbreaking. Cynthia is a beautiful woman with an Ultra Brite smile. She works is sales at Thistle Farms where her warm and engaging personality shines. Shana, who is a dynamo, also works in sales. Jordan, shy and sweet, works in production. Gayle invited me to a class in Nashville. They all offered to come back and speak to the girls at my daughter’s school. These women are about growing, giving, and gratitude. I love who they are in the world. We were so fortunate to meet Gayle, Cynthia, Shana and Jordan. The simple meal was a gift for us and object lesson for practicing healing. We witnessed how love heals. Thanksgiving at Thistle Farms must be amazing. Such a meaningful, special message. Happy Thanksgiving to you and your family!